green tea: "How's the map going?" Everyone from co-workers to local acquaintances to family and friends at home all want to know how the map of Thimphu is coming along. I'd say, on one hand, it's going well as I have passed my draft sketch of the main town on to a talented artist here who is going to draw the final version. I can't wait to see how it looks! On the other hand, I am leaving in 3.5 weeks and there's still so much to do including finishing the research and drawing for the map of the larger city, following up on more leads for info, doing the text on the artist's map when it is done, adding special focus for sponsoring businesses, making directories of businesses and government offices... I have to stop listing tasks now because I'm stressing out. Yesterday was a typical day of work on the map for me. In the morning, I went to the office to send e-mails and check up on some facts online. In the afternoon, I walked south through a residential neighborhood to take photos and notes and also to check on a couple of shrines that I know are in the area. One of them turned out to be within the police compound so I couldn't get inside to take a look. The second was one I had seen from across the river on another walking trip because it is bright orange. 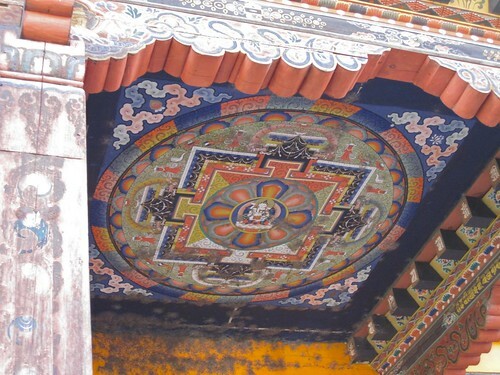 I think this was the so-called 'Tibetan lhakhang' although I can't find its proper name anywhere. There were a few people at the shrine when I went there but due to the language barrier, I couldn't ask the name of the shrine. There's a bright mandala on the awning above the door. 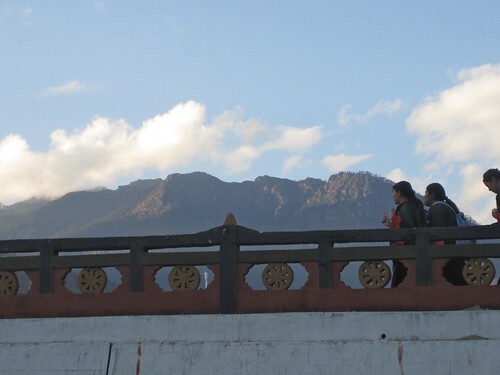 As I was leaving the lhakhang, I was hailed by some young boys with "waaai, chillip!" ("heeey, foreigner!"). They wanted to have their photo taken and to try out my camera. I supervised closely. 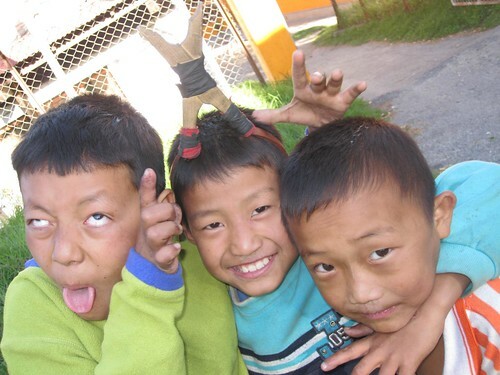 One of the boys is wearing his slingshot as a head ornament (yes, kids really play with slingshots here). 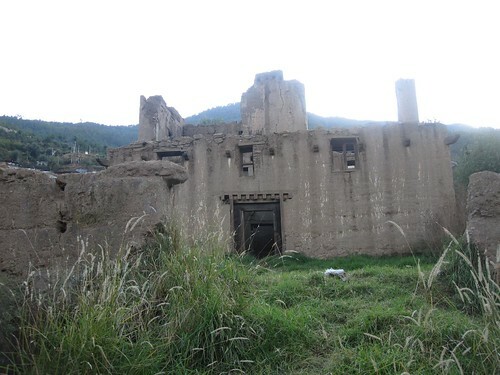 I walked another 20 minutes south to the area called Changzamtog to check out a giant cypress tree and ruined buildings I had spotted from across the river. Again, nobody around here seems to know anything about this tree which has a special sacred base and people were walking around it clicking through their prayer beads. 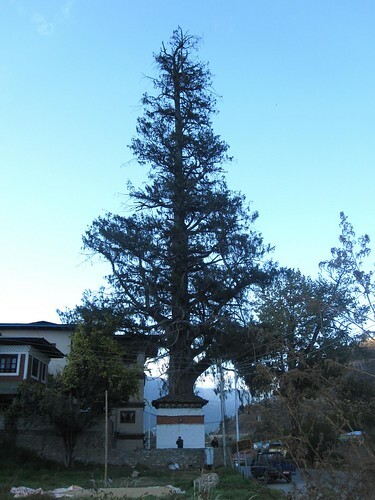 The cypress is the national tree but I wonder if this particular tree has a story behind it. Beside the tree are some ruins of houses which are quite picturesque given their urban setting. From here, I walked about 45 minutes to home and worked some more on the map. It's looking great! I can't believe you're almost done over there! 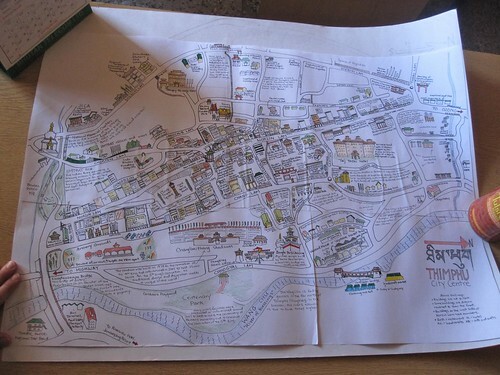 Ande, The Map is going to be your biggest gift to The Kingdom of Bhutan. You will always be remembered for that. I am inspired. I would like to consider making a map of Wangdue. But wait, let me see yours first. That's a huge compliment, Passu! I have no doubt you could do a Wangdue map... but aren't there about to be some major changes around there very soon? I think it will take me until the town is up so change won't be a problem. wow andrea this is really cool. I cant wait to see the final output. u did a great job.the map is really good. 20,000 copies to be printed! TCB made a generous offer to buy the full rights to my map but my sponsors declined! The artist's version looks 50x better than mine, believe me.